Whoa, you guys the day is finally here! 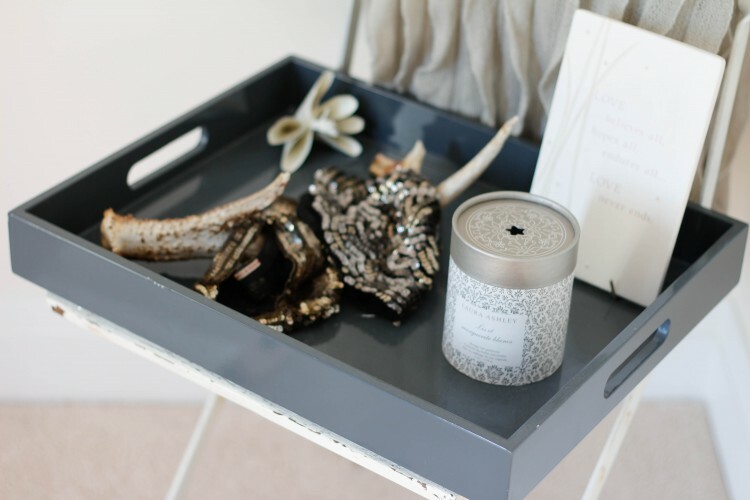 I swear I have never dragged out a blog post longer than I have this nursery reveal. There were so many elements that went into this room that ended up taking so much time and many weekends of Jamie and his dad working away from morning until night. 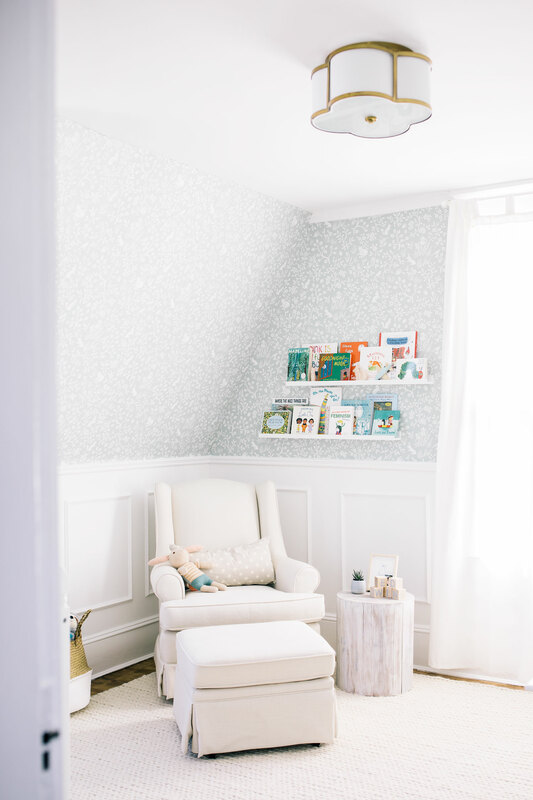 From painting the walls to the wainscoting, putting up the wallpaper, sanding and staining the floors, this project was entirely DIY and I could not be prouder of my husband and every.single.person that helped bring this nursery to life. 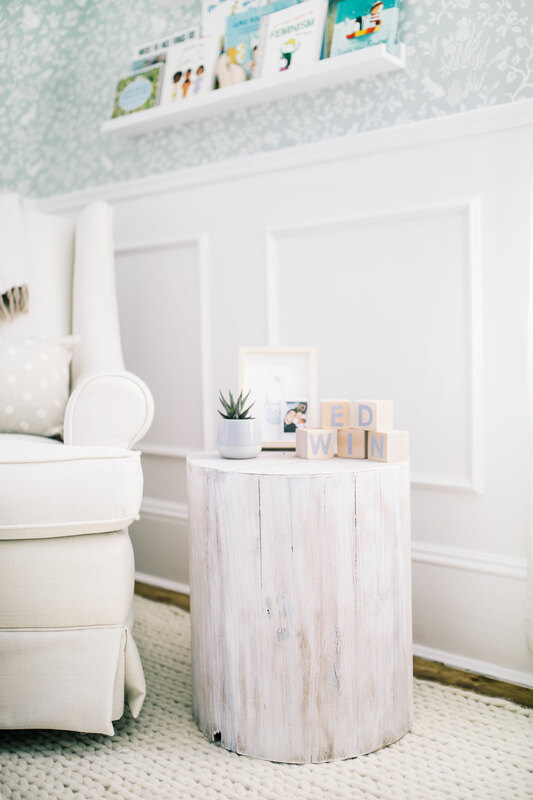 The nursery has been completed for a couple of weeks now, but life with a newborn is hectic and so I am only now just getting around writing this post…sorry! 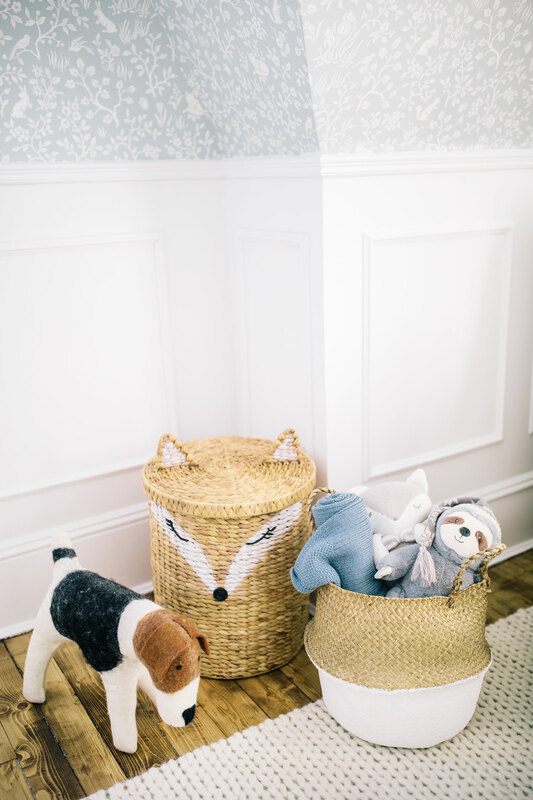 Back in January, I shared a peek into what Little Logan’s nursery was going to look like, and now that it is finally complete, I am thrilled with the end result…it looks EXACTLY how I pictured it in my head but better! This is my favourite (it’s also the only complete) room in the house and I just find it to be so calming and serene. I wanted a gender neutral nursery that wasn’t to bold yet still felt child appropriate. I think that idea was achieved through the use of a light, neutral colour palette, lots of texture, subtle mixing of prints and finally, pops of colour through the artwork and floating bookshelves. 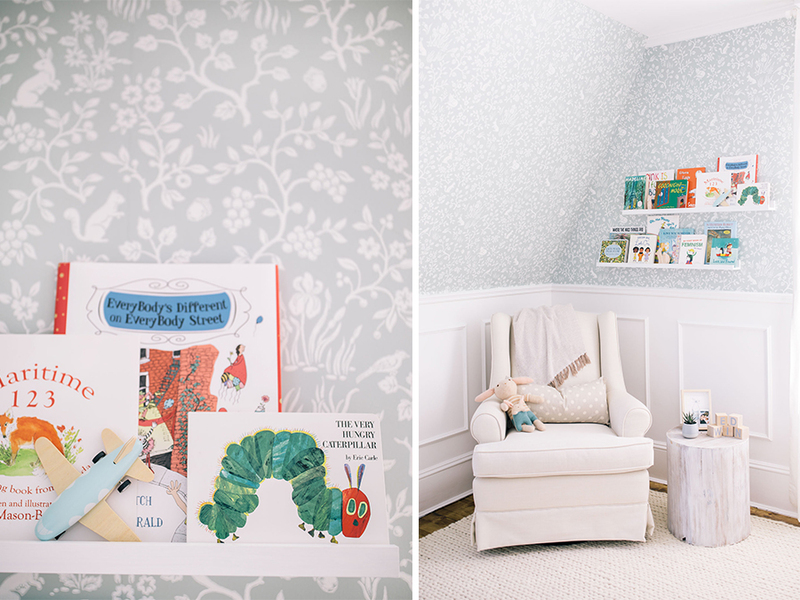 We worked with some amazing brands to create Edwin’s nursery. Most notably buybuy BABY, who sponsored the glider, ottoman, crib and dresser, Wayfair who provided the wallpaper, light fixture and floating shelves, and Etsy who gifted us many unique decor pieces (I’ll share more of my fave baby Etsy shops and details next week on the blog).I am thrilled to be sharing Edwin Fox’s nursery with you today so please keep reading to take a tour and see how this all came together. 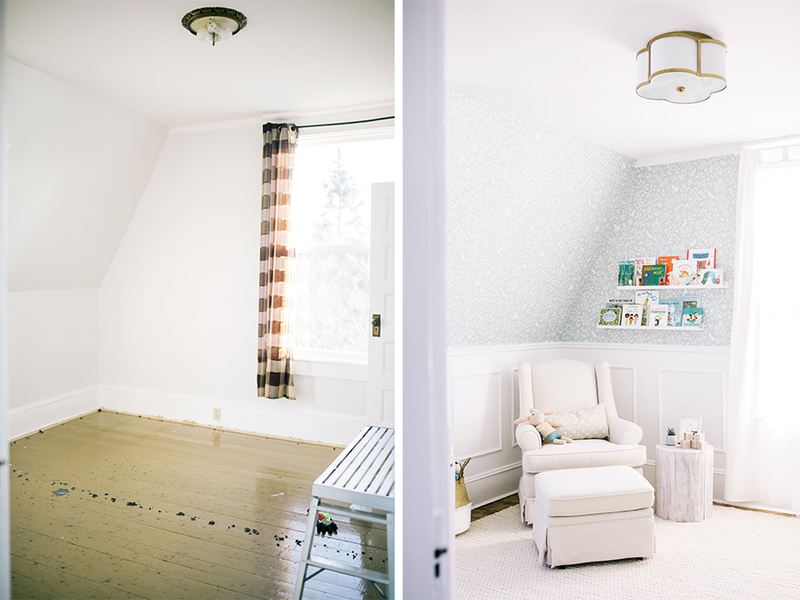 The before and after of the nursery is pretty drastic if I do say so myself. As you can see, the room needed a total facelift and facelift it certainly received. First, the walls were prepped for painting by Jamie’s mom who covered all of the preexisting cracks and holes and sanded the walls down. 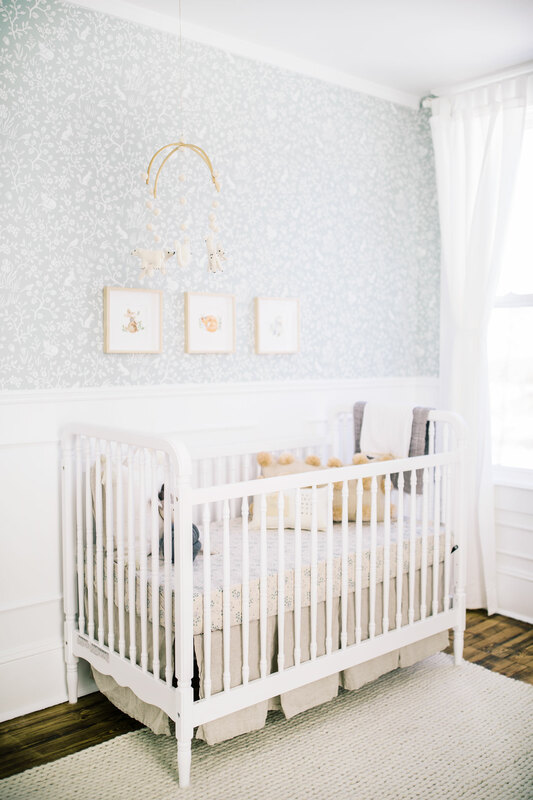 Next, the nursery was painted in Benjamin Moore’s Chantilly lace. 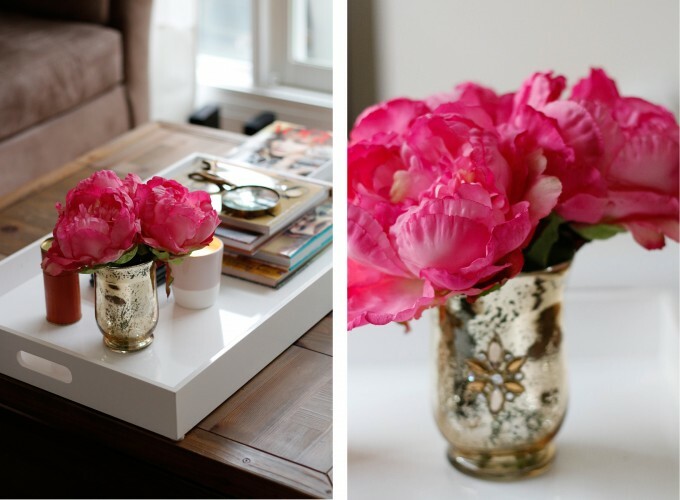 This white is crisp and clean and really brightened up the room and made for the perfect starting point. The wainscoting and chair rail came next and thankfully, my cousin knew all about putting this type of trim up and he helped us out immensely. Finally, the awful floor that was covered in 3 layers of paint was sanded, stained and sealed. The stain colour we chose for the floor is “Minwax Early American”. 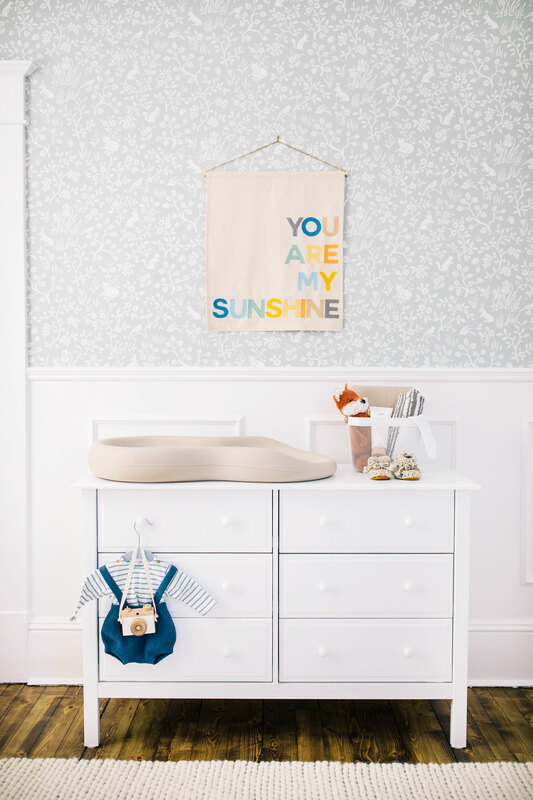 While I love every piece in the nursery, the glider and ottoman are my favourite. We visited buybuy BABY in store to custom order this glider and I could not be happier with 1. the service we received and 2. the end result of the glider. buybuy BABY has in-store experts who offer free one-on-one personal shopping appointments which was ideal for an afternoon of trying out gliders. Melissa, who helped us out at the Bayers Lake buybuy BABY location, was so helpful, kind and knowledgeable. She knew literally everything there is to know about the gliders offered at buybuy BABY so we felt very confident in our final decision. After trying out mostly every glider, we landed on the “Roni Swivel Glider” in “linen” which is a custom glider only available to order in store but there is a similar glider online here and here. The Roni Swivel Glider is so comfortable and ideal for nursing Edwin. Both the glider and the ottoman rock and swivel back and forth and the glider is so supportive which ensures good posture while nursing. 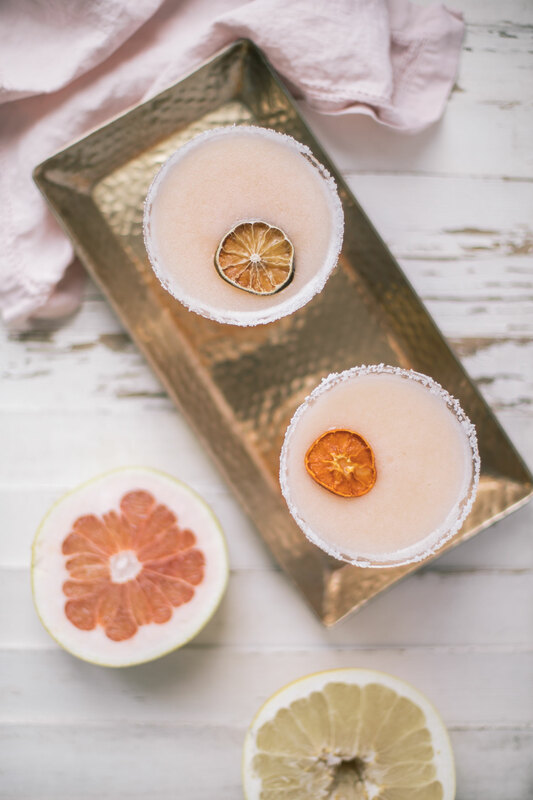 While I know a lot of people would protest going for a light linen colour (don’t worry you can choose from multiple different colours), I simply couldn’t say no to this gorgeous creamy shade in the linen texture. I just put a blanket over the glider when I’m nursing to ensure it stays spotless. My sweet friend, Mallory from The Lady Slipper Blog, painted and framed this trio of woodland animals as a surprise. It was the kindest, most unexpected gift. Mallory actually didn’t know that Edwin’s middle name was going to be Fox at the time and so when she found out she was so excited she’d decided to paint a fox. I love this little fox stuffie from another one of my girlfriends. This toy was actually what got me thinking about the name Fox. We already had this wooden stump from our house in Toronto. I knew I wanted some sort of end table in the nursery and thought that this stump would work perfectly as such. It was originally a dark brown wood and so we decided to sand it and white wash it. The wooden blocks are custom name blocks from “The Tot”, succulent is Ikea and the frame is also from Ikea. In the frame, is a card from my sisters (Edwin’s Aunt’s) and a Instax selfie we took in the hospital. 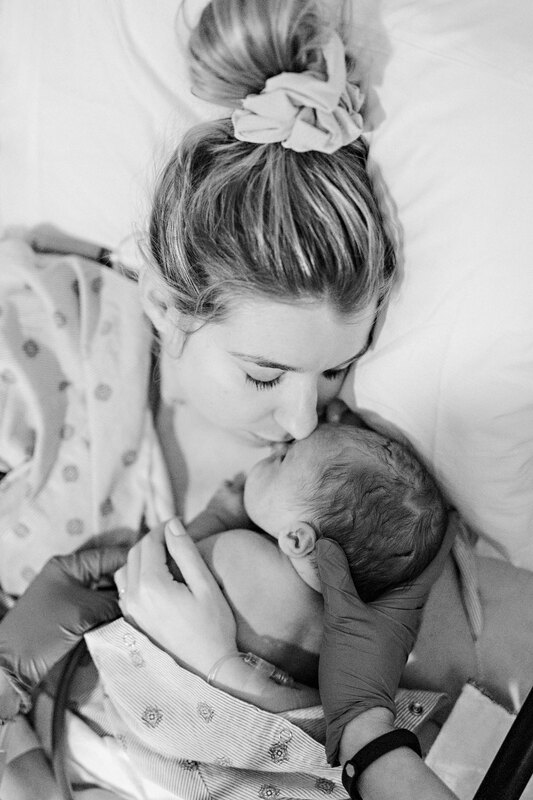 Even though we did professional photos in the hospital, I think this instant photo is my most treasured picture. 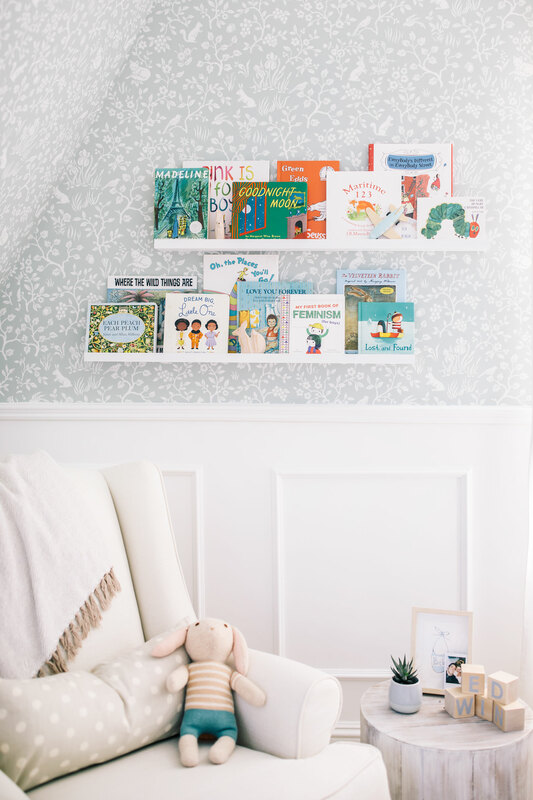 Books were a very important element in the nursery and I’ve always been a fan of floating book shelves to display them. Edwin has so many books but I chose to display some of my personal faves / went for a green/blue/orange theme to style the shelves. Some of my personal favourite books on the shelf are Everybody’s Different on Everybody Street, Maritime ABC & 123, I Love You Forever, My First Book of Feminism for Boys and Oh, The Places You’ll Go. On the shelf, I also incorporated a few wooden toys like a little plane, wooden fox and bunny. The dresser, also from buybuy BABY is called the DaVinci Jayden Dresser and is perfect for storing all of Edwin’s clothes, swaddles and other items. It has sleek, clean lines and will easily grow as our little guy does. The dresser also doubles as a change table which is ideal. We bought the Keekaroo peanut changer because it’s safe, soft, bacteria resistant and easy to clean. The large stuffed dog toy was the first item we ever bought for our baby. We found the dog at Farmhouse Pottery in Vermont and had to buy it because it reminded us so much of Milo. I can’t wait until Edwin is old enough to play with it! 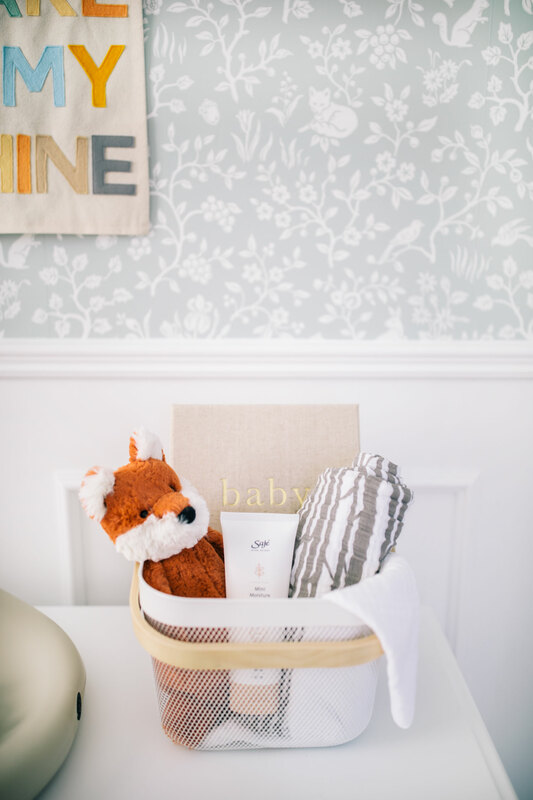 The fox toy basket was also an item I stalked online for months and am so glad when I finally saw it available to order on the Pottery Barn Canada website. 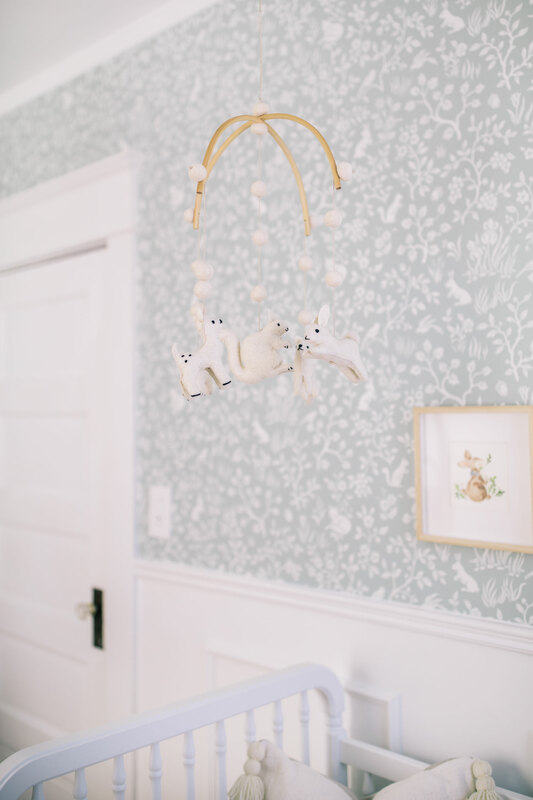 This woodland mobile matches the wallpaper perfectly and is simply adorable! 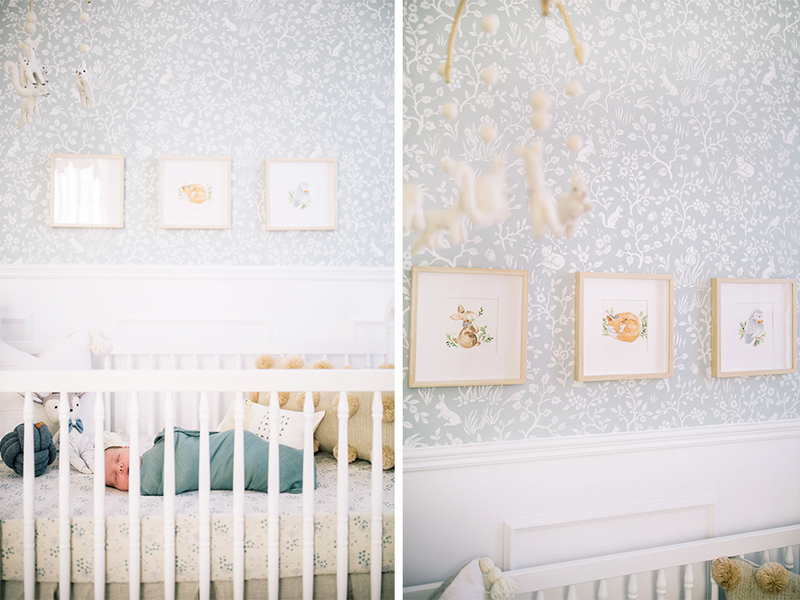 Another one of my favourite items in the nursery is of course, the crib. 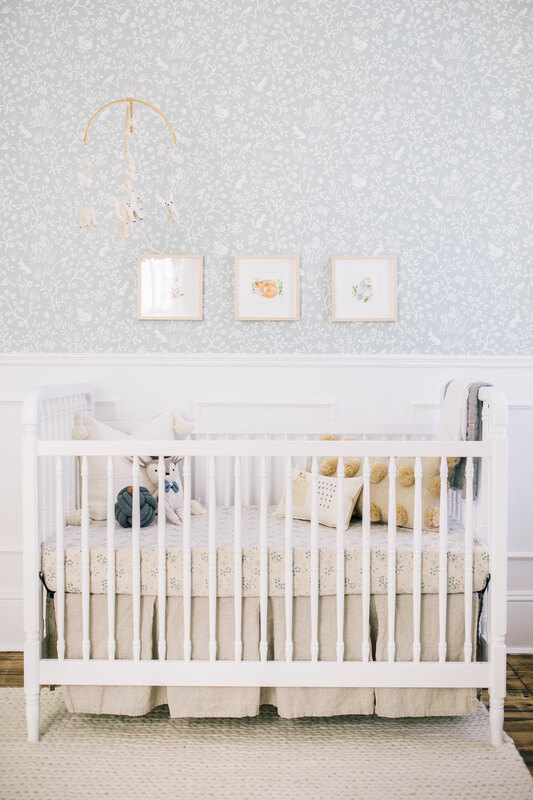 It is by Million Dollar Baby from buybuy Baby and I think it is just such a classic looking crib, especially because of the spindles. buybuy BABY offers an amazing assortment of items from top brands, for every style and budget. This crib is a great example of that. It is great quality, oh so stylish and under $500. As well, for those that need a little extra help in the nursery design department, buybuy BABY offers decorating services! 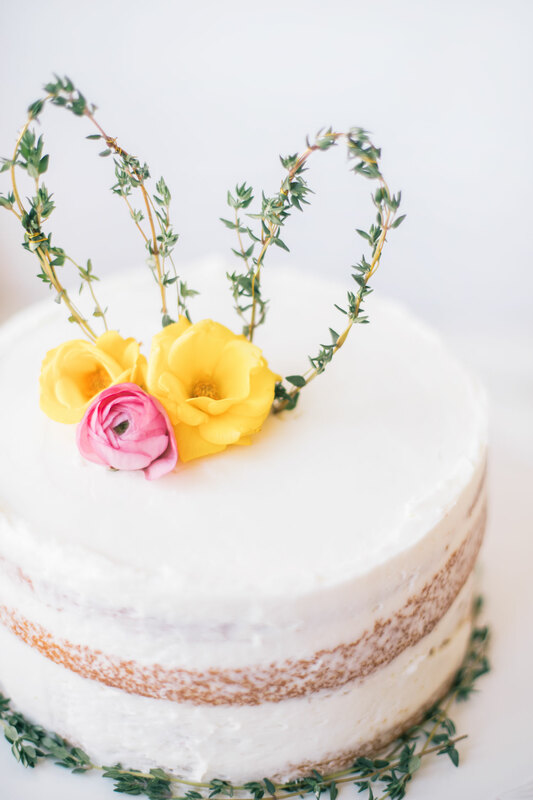 As well, Registering with buybuy BABY gives you easy access to in-store registry consultants, referral awards, price match promise, decorating service, completion discount and registry announcement cards. This knot pillow was a gift from a friend and matches the crib so perfectly! 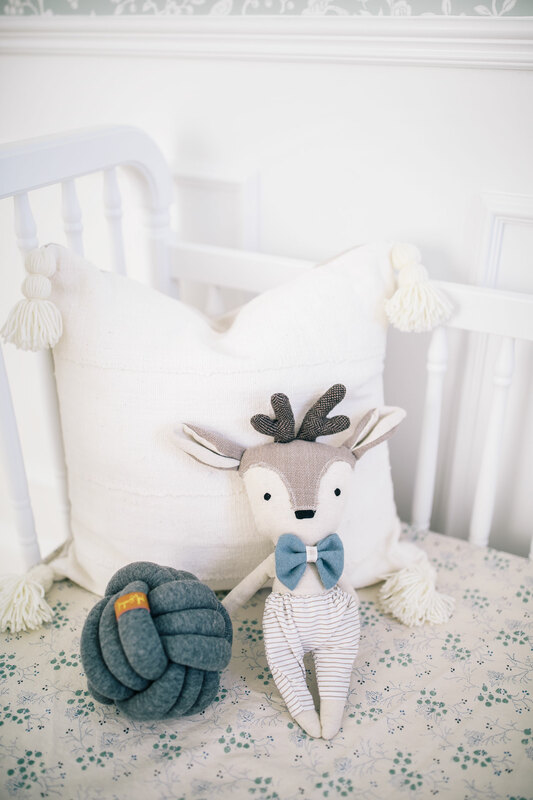 The stuffed deer is from the brand Eparpillee. This particular stuffie is no longer available but they have a similar lamb stuffie here. 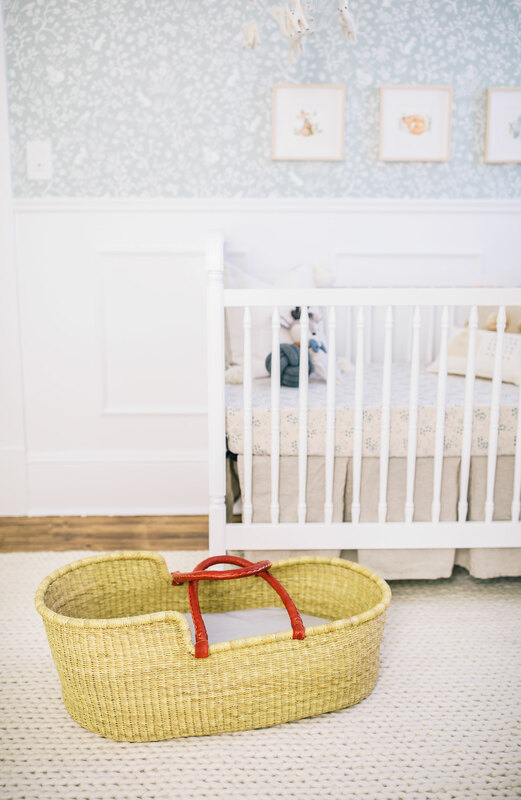 I absolutely love toting Edwin around in this basket bassinet from Mmabia Baskets. I use it all throughout the day when Edwin is napping.